1. How to set up SMTP configuration ? Please provide your smtp username and password to working the email properly. Go to your php.ini file and enable the "php_openssl" in you PHP setting. You need to enable extension=php_openssl.dll on php.ini file.If you are still facing the problem then the port 465 is not available. 2. How to Check email working ? 3. How to fix "Email reply on task notifications not working" ? Check Whether imap is enabled or not. 4. How to fix upload image issue ? Put the below code beginning of the file. 5. How to set Subfolder ? You will get the below output, if the SUB_FOLDER in the constants.php file is not set properly. Ex:- Let your sub folder is "orangescrum". 6. Issue on Ubuntu with respect to htaccess ? 7. 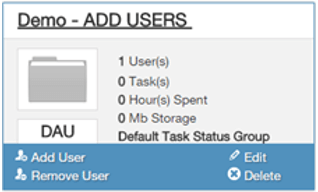 How to "Add" and "Remove" users to an existing project ? We will refer to some images along with the articles to show you better how you exactly do that. Click on 'Project' button to select a project you had already created. When you hover on ‘You project’ a menu will appear at the bottom. From that menu select Add/remove users as you wish to do. A second window will open showing the name of the users that exist in that project. Tick mark the name(s) and take the required 'Add/Remove' users action. Go to 'users' button on the Left hand side of the screen. Click it. When you click it, the screen will show a button "Invite Users". Click it. 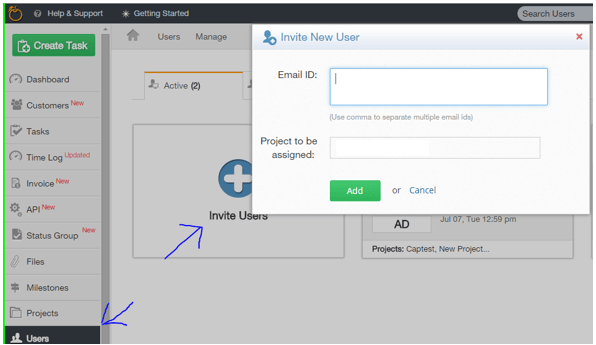 Enter the email ID’s along with the name of the project to be assigned to the users. Click on Add button below and it is all done. 8. Daily catch up feature not working or is disabled after installation ? The Daily catch up is a feature fully available in Open community version. If by chance it is not working or is disabled; Use these two files from the below GIT links and replace them in your project folder. Although the app/Controller/ProjectsController.php and the app/View/Projects/groupupdatealerts.ctp has been updated and issue has been fixed. 9. Google login is not working ? This should serve as the solution to such a problem. Please note: There can be different problems that can appear. This solution is not relevant for a specific problem. If there is another problem, please take a screen shot, write the problem and share it with OrangeScrum Team to have a look. 10. How to ensure quickly no login and css problem after installation in open community version 1.5.8 ? A. Such a problem is not the package problem you receive to download and install the application. B. This is the problem related to the configuration of your server. C. This can be solved with the .htaccess in the root. 11. Send emails without SMTP ? 12. What to do when quick Sign up fails when installing on WAMP ? So while Installing on WAMP, in the problem you would generally notice that after having filled up the form and clicked the sign up button, the button turns to a broken symbol and the app goes nowhere, also the system states that the file is not found. A. Check out the constants.php and database.php file. C. Or the .htaccess may not working. Activate htaccess on your environment/server. Please refer to the following codes below with the possibility if the orangescrum.zip file does not include the required .htaccess file in the root folder. Or visit; http://www.orangescrum.org/how-to-install-orangescrum-in-godaddy for the complete instructions on how to install OrangeScrum on your go-daddy server. 13. Having Sign up problems even after a successful installation ? 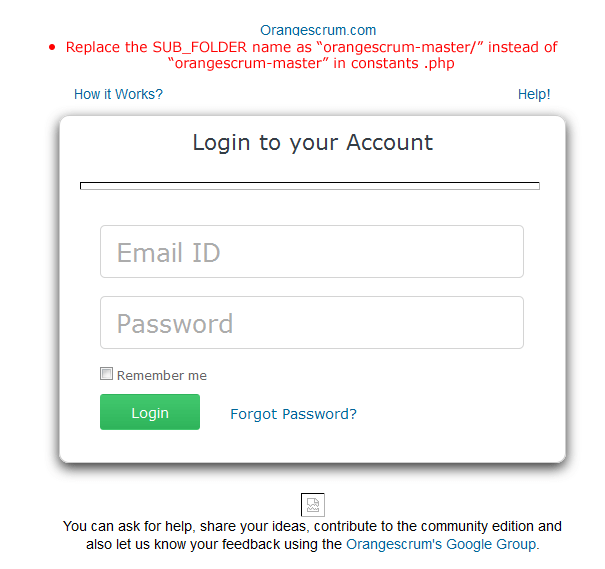 Note: you can replace "orangescrum" with the folder you created. 14. How to fix Download task issue ? Please create a folder 'zipTask' inside 'app > webroot > DownloadTask' directory. Give write permission to the folder zipTask as well as DownloadTask. Download will work as expected. 15. What about the refund policy ? We do not process refunds for add-ons or installation services. However, we will support issues if any encountered during the add-on installation (provided you've followed and met our installation requirements). Also, we recommend reviewing our add-on demos before making a purchase. 16. Can I personalize Orangescrum? Yes, you can customize your Orangescrum site title, favicon, upload logo in sign up, sign in page. Please refere here how you can customize Orangescrum. 1. Why am I getting "Error in creating Company Name" in quick sign up page? For this, we need to disable "mysql strict mode"
Open phpMyAdmin.Look at the top and towards the right for variables. Click on that then either scroll down to sql mode or use the filter. Hover over the row that says sql mode and an edit button should appear. Note: For "shared hosting",we need root permission to disable mysql strict mode. 2. Why am I not able to invite user and/or receive any Orangescrum emails? Due to some security reason, maximum shared hosting providers (e.g godaddy, hostgator etc.) do not allow configuring outgoing mail server. We need to ask them to give access to the particular mail server for outgoing mail. Need to disable two step verification and "enable less secure apps" and also "enable POP and IMAP" in Gmail settings. 3. Why my email replies are not being posted in the Orangescrum tasks? For this, you need to give proper IMAP hostname and other credential in EmailReply.php file in app/webroot folder. 4. Why am I facing 500 internal server issue? Most of the shared hosting users provide 777 permission to "tmp", "webroot" and "Config" folder. This is the reason you get 500 internal server issue. Orangescrum webroot folder doesn't require complete permission for hosting. However, you need to give 755 permission to all above folders.